This book brings together contributions from key investigators in the area of pathological pain. It covers the molecular basis of receptors and channels involved in nociception, the possible messages that cause neuropathic plasticity, spinal plasticity in neuropathy, plastic changes in opioid systems in neuropathy and opioid tolerance, and plastic changes related to pathological pain. 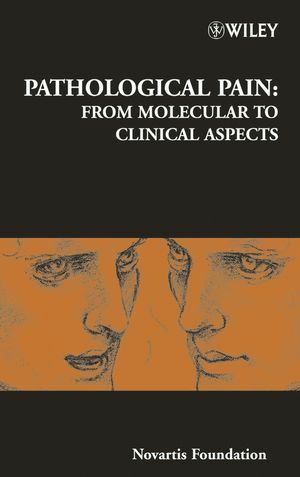 Derek J. Chadwick and Jamie A. Goode are editors for Pathological Pain: From Molecular to Clinical Aspects and other scientific titles. Regulation Mechanisms of Vanilloid Receptors (Makoto Tominagaet, et al.). Sodium channels and neuropathic pain (Jin Mo Chung and Kyungsoon Chung). Ion channel activities implicated in pathological pain (John N. Wood, et al.). Chronic pain and microglia: the role of ATP (Kazuhide Inoue, et al.). Neurotrophic influences on neuropathic pain (Stephen B. McMahon and William B. J. Cafferty). Changes in DRG neurons and spinal excitability in neuropathy (Koichi Noguchi, et al.). Functional reorganization of the spinal pain pathways in developmental and pathological conditions (M. Yoshimura, et al.). Central plasticity in pathological pain (Min Zhuo). Anti-opioid systems in morphine tolerance and addiction: locus-specific involvement of nociceptin and NMDA receptor (Hiroshi Ueda). Chronic morphine-induced plasticity among signalling molecules (Alan R. Gintzler and Sumita Chakrabarti). Opioid tolerance and neuroplasticity (Jianren Mao). A mechanism-based understanding of bone cancer pain (Patrick W. Mantyh). Mechanistic and clinical aspects of complex regional pain syndrome (CRPS)(Ralf Baron). Cortical pathophysiology of chronic pain (A. Vania Apkarian). Final Discussion: Translating basic research to the clinic.